Mild hyperbaric oxygen therapy (mild HBOT) involves breathing concentrated oxygen in a pressurized chamber. Because of the increased pressure, oxygen loads not only the red blood cells but the plasma as well, allowing the increased oxygen to deeply penetrate the body’s tissues. It boosts cell growth by delivering increased amounts of oxygen to blood, tissues, and organs. Increased oxygen accelerates bone, skin, and muscle regeneration, helps the body fight infections more effectively, and has a powerful anti-inflammatory effect. 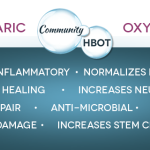 In essence, hyperbaric oxygen therapy accelerates the healing process, strengthens and normalizes the immune system, and allows body functions to improve. Over time the combination of increased oxygen and increased pressure allows tissues and organ function to change in ways that were perhaps not physiologically possible before the treatment. HBOT is a powerful anti-inflammatory and normalizes immune function, so is helpful for autoimmune and inflammatory disease, such as rheumatoid arthritis and its many related forms. It stimulates growth factors and mobilizes stem/progenitor cells, which aid in the recovery of damaged organs and tissues. It is used pre- and post-surgery to facilitate good outcomes. HBOT encourages DNA switching and mitochondrial biogenesis, which are critical in neuro-rehabilitation and treatment of autism, cerebral palsy, stroke, and traumatic brain injuries. It allows healing of delayed radiation and thermal injuries by encouraging neo-vascularization—stimulating the growth of small capillaries back into damaged tissue. Athletes use it for its performance enhancing qualities and to aid muscle healing. 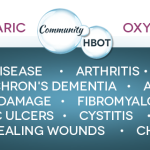 Hyperbaric oxygen therapy is used internationally for more than 80 different conditions. Over 30,000 research studies support its use for anemia, arthritis, athletic injuries and performance, attention deficit disorder, autism, auto-immune disorders, Bell’s Palsy, brain and head injuries, cardiovascular disease, cerebral edema, cerebral palsy, Crohn’s disease, dementia, conditions, diabetes, interstitial cystitis, irritable bowel syndrome and colitis, Lyme disease, learning disabilities, macular degeneration, multiple sclerosis, neuropathies, non-healing wounds, Parkinson’s, pervasive development disorders, PTSD, reflex sympathetic dystrophy, reconstructive surgery, spinal cord injury, stroke, TBI and more. Our staff physician is certified in Undersea and Hyperbaric Medicine. 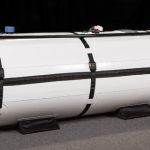 Community Hyperbaric is also a DISTRIBUTOR of hyperbaric oxygen chambers. If you would like to purchase a chamber, contact us at 802-472-8900.